Accurate transcription, abstraction, and organization of research data are essential skills for accurate evidence analysis. Whether you want to become credentialed or not, the Genealogy Standards1 define the criteria good genealogists strive for. These standards are also the criteria for evaluating a certification application by the Board for Certification of Genealogists (BCG). I completed my initial certification process in 2010 and have now been through my first renewal. Many colleagues have been through the process, some who achieved certification, some who did not, some who achieved certification on a second attempt. Surprisingly to me, foundational research skills are where many of us fail to meet or only partially meet the standards. We all think we know how to do these very basic and simple tasks. Sometimes we are not the best judge of our own skills. All of us can use guidance from expert practitioners to improve our skills. The BCG Education Fund Putting Skills to Work workshop at the NGS conference in Ft. Lauderdale is designed to improve those foundational skills. Registrants attend two half-day hands-on workshops. Jeanne Larzalere Bloom, CG, will lead the session “Spreadsheets 201: Manipulating Data to Dismantle Brick Walls.” Students will use spreadsheets to reveal otherwise hidden patterns that can resolve problems of kinship and identity. Prerequisite: knowledge of basic spreadsheet skills. Jeanne is a full-time professional researcher specializing in Chicago and Cook County research, forensic genealogy, problem solving, and multi-generational family histories. On behalf of the Department of the Army, Jeanne searches for and identifies family members of unaccounted for servicemen from World War II, the Korean War, and the Vietnam War. Jeanne writes articles for scholarly journals and society publications. She is a frequent lecturer at conferences, workshops, and institutes. 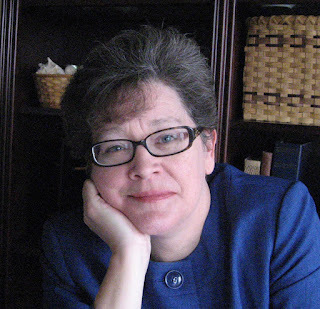 She is a Trustee and the president of the Board for Certification of Genealogists. David McDonald, D.Min., CG, will lead the session “Reach for the Power Tools: Transcriptions & Abstractions.” Students will work with various documents to transcribe, abstract and analyze the material, with an eye toward developing effective research plans. David has more than thirty years' research experience throughout the United States, Canada, and in various European countries, particularly the British Isles and Germany. Dave's research specialty is in the "Old Northwest," those states (or parts thereof) formed from the "Territory Northwest of the River Ohio": Ohio, Indiana, Michigan, Illinois, Wisconsin and Minnesota. In addition to these states, Dave has conducted extensive research in neighboring states, such as Kentucky, Iowa, Missouri and Pennsylvania and elsewhere across the United States. 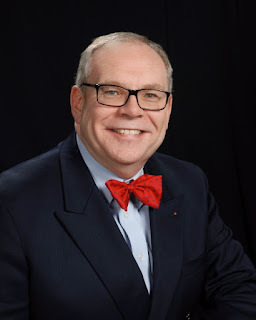 He has research interests in transcontinental migrations of New England families, the effective use of Christian church records and repositories, and fraternal organizations and societies and their records of genealogical interest. Dave served six years on the board of the National Genealogical Society, and has lectured throughout the US and UK. His personal research includes work in England, the Mid-Atlantic, colonial-era New York and Virginia, Kentucky, the Midwest and the Great Plains. He has also done extensive work in the UK and on Germanic lines from the sixteenth century onward. The Putting Skills To Work pre-conference workshop will be on Tuesday, 3 May 2016, 8:30 AM–4:30 PM. Putting Skills To Work is a unique full-day, hands-on workshop limited to sixty participants. The focus is skills needed by anyone practicing serious genealogical research whether as a family historian, librarian, dedicated hobbyist, or writer. Materials are geared to intermediate and advanced practitioners and advocate established genealogy standards. The $110 registration fee includes lunch, two in-depth presentations, hands-on exercises, syllabus, handouts, and active class participation. NGS Conference registration is not required. Sessions typically book to capacity before the NGS Conference registration deadline. Come join these two experts and build your foundation for better research in the future. Registration is through the NGS Conference registration site at http://conference.ngsgenealogy.org/. If you've already registered for the conference, just login and add the Putting Skills to Work workshop. If you haven't registered yet, now is the time to do it! For more information see BCG Education Fund web page. 1. Board for Certification of Genealogists, Genealogy Standards, 50th-anniversary ed. (Nashville, Tennessee: Ancestry, 2014). Debbie Parker Wayne, "Build a Firm Foundation - Transcribe, Abstract, Organize," Deb's Delvings Blog, posted 14 February 2016 (http://debsdelvings.blogspot.com/ : accessed [date]). 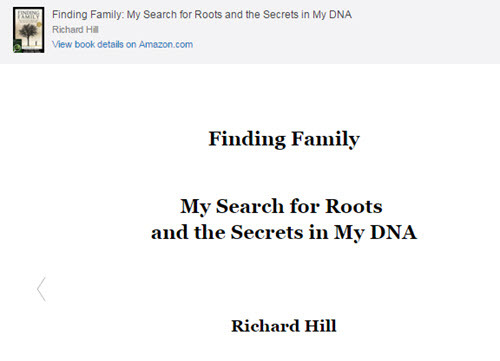 Since 2012, Richard Hill's book Finding Family: My Search for Roots and the Secrets in My DNA has been one of my favorite books, describing how to use DNA for family history research and Richard's personal quest to identify his biological parents. Most reviews of the book describe it as a page-turner that holds the reader's interest like the best novels do. Many of us stayed awake reading long into the night because we could not put the book down. A new Amazon feature allows a preview of the book to be read without the necessity of downloading a Kindle app to your computing device. Richard's link to this preview at http://amzn.to/1nyZc5w allows you to read several chapters of the book. The preview will pull you in so you want to read the rest of the story. The Kindle version purchased through this preview link includes Richard's Guide to DNA Testing: How to Identify Ancestors, Confirm Relationships, and Measure Ethnic Ancestry Through DNA Testing as a bonus. If you decide to purchase the book, a free Kindle app is available for handheld, laptop, and desktop devices. Click this link to download the windows computer version. Search for "kindle" on your favorite app store for links to download to smart phones and other handheld devices. I've used a kindle app on my Android tablet and phone and Windows 7 laptop for many years with no major problems. I love being able to take a whole library in my bag with no added weight like I had when I had to carry printed books with me. Debbie Parker Wayne, "Free Preview: Richard Hill's Finding Family," Deb's Delvings Blog, posted 11 February 2016 (http://debsdelvings.blogspot.com/ : accessed [date]).